Subsequently, Edwards was removed from his position and temporarily replaced by the Reverend John Brown, a Cashaway member who had previously served Welsh Neck Baptist as minister. Eventually, the Reverend Evan Pugh was called to lead Cashaway in 1767. He, too had come from neighboring Welsh Neck Baptist Church. Nearly two decades later, in 1785, nearby Mount Pleasant Baptist Church was organized, and the Reverend Pugh began serving that congregation as well. This church initially met in a schoolhouse. Meanwhile, a church was forming in Dovesville at the home of Christopher Teal. This group would become Black Creek Baptist Church, and Pugh also led many of Teal’s early services. In 1791 Mount Pleasant Baptist built its own sanctuary. Concurrently, many of the members of Cashaway began attending the new Black Creek Baptist Church, which had built a meeting house in 1784. Mount Pleasant Baptist Church and Cashaway Church then merged under the name of Mount Pleasant Baptist Church. Following the formation of Darlington County in 1785, new villages were established. Mechanicsville, about 10 miles below Society Hill, was one such hamlet, and the merged church, Mount Pleasant Baptist, relocated to this young community around 1813. It built a new sanctuary and changed its name to Mechanicsville Baptist Church sometime between 1815 and 1816. Still an active congregation, the charming white church that stands today was built in 1920. The article below was contributed to the South Carolina Picture Project by Bill Segars of Hartsville. It originally appeared in his local paper, The Darlington News & Press. It was first published in November of 2015. A bird can only fly so high until he must come back to roost. I’ve come back to a Darlington County church this week. I thought I had selected an easy one to write about. Well, as I began to do an in-depth study of Mechanicsville Baptist Church, all wasn’t as it appeared. There are many dates and many names associated with Mechanicsville Baptist. Many of you may think that this makes research interesting, and interesting it is, but it’s also confusing when you’re trying to be accurate with dates and facts. So if I’m not exactly correct on every date, I’ll apologize now. One of the few facts that I’m sure of is where Mechanicsville Baptist Church is. It is located at 2364 Cashua Ferry Road, in downtown Mechanicsville, South Carolina. From that I’ll try to piece its history together in an understandable manner. I have obtained this history from a document compiled by the church in 2004 and a document compiled by Mr. J.H. Napier in 1947, as well as other historical Baptist records. Unfortunately, due to incomplete original records, interpretations of those records are very often left to the reader’s opinion. The early Welsh settlers of this part of Darlington and Marlboro counties moved here from James Neck in the early 1750s. James Neck is what we know today as Society Hill. Let me give you some perspective on this distance. As the crow flies, the distance from Society Hill to Mechanicsville is 14 miles. Since the settlers couldn’t fly, they traveled by boat on the Pee Dee River, a distance of 29 miles. They made this trip in an effort to find a better place to raise their families. Along with them they brought their strong Baptist beliefs and formed Cashaway Baptist church on September 28, 1756 with 14 charter members. Cashaway – that seems to be a strange name for a church. Like most names, there is a story behind it. Legend holds that the church was built near the intersection of the Pee Dee River and the present South Carolina Highway 34. The church operated a ferry for crossing the mighty Pee Dee River. Of course, with no credit cards, cash was the only payment accepted, thus the way to cross the river was cash – Cashaway. The church building was built from revenue gained from operating the ferry. To understand this a little better, today we know SC 34 as Cashua Ferry Road. This area of the Pee Dee cannot be discussed without mentioning the Reverend Evan Pugh. For those of you who may be interested in learning more about the Reverend Pugh, the Darlington County Historical Commission, located at 204 Hewitt Street in Darlington, has a wealth of information concerning him. Even though Mr. Pugh was a trained surveyor and worked with George Washington in Winchester, Virginia, he was ordained as a Baptist minister in 1764 at Welsh Neck Baptist Church in Society Hill at the age of 35. I mention the Reverend Pugh at this time because records do indicate that he preached at Mount Pleasant Baptist Church (also known as Lowther’s Hill) and Cashaway in 1764. This is when the facts get somewhat confusing. Services were held at Mount Pleasant Baptist Church as early as 1758 at a location about 2 miles south of Cashaway, possibly at the School House. There is no record of a church building there until 1786. When Pugh and Major Robert Lide went to the Charleston Association meeting as delegates from Cashaway in 1791, they asked for permission to change the church name to Mount Pleasant. That permission was granted, and the name of Cashaway Baptist Church seems to disappear from the records after that. Pugh continued to preach at Welsh Neck, Mount Pleasant, and several other area Baptist churches. He died on the day after Christmas in 1802 and was buried on his plantation, Pughfield, near the present-day Mechanicsville. Again, history repeats itself with name changes. For some reason, in 1813 the original Mount Pleasant congregation reconstituted itself as Mount Pleasant Baptist Church. Then in 1815 the church moved 1.3 miles south to Mechanicsville and begin holding services in the Mechanicsville Academy building. 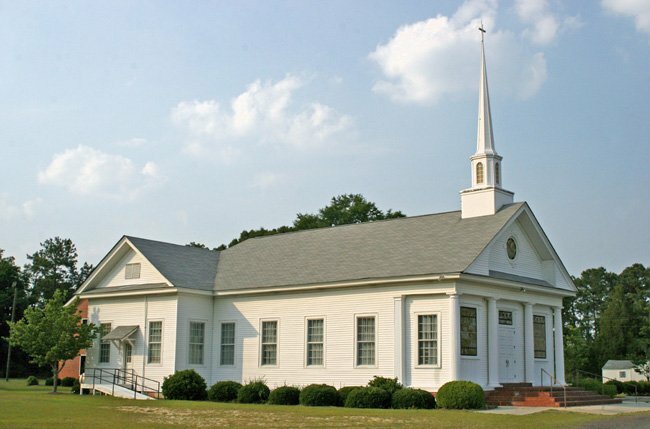 On October 17, 1816 a formal church was established under the name Church of Christ at Mechanicsville. According to the church minutes of June 13, 1818, Mechanicsville Baptist Church, “Received a Deed from Brother James Lide for two Acres of Land on which a house of Worship is built at Mechanicsville….” This deed is the first time that the name “Mechanicsville Baptist Church” appears on a legal document. I certainly hope that I didn’t lose you with those dates and name changes. If you’d like to reread the last few paragraphs, feel free to do so. It’s confusing to me, too. I think basically what happened was that two churches were formed within a mile or so of each other about the same time, Cashaway (1756) and Mount Pleasant (1758). Both may have shared some members. Cashaway folded first (1791), and then Mount Pleasant merged with Mechanicsville Baptist (1816). Was that any clearer? I hope so. My main confusion is that Mechanicsville Baptist Church in 2004 claimed to be 250 years old, putting its established date in 1754. I’m by no means disputing that directly, but I’ve yet to find a 1754 date associated with any of these congregations – 1756 maybe. I have no doubt that the ancestors of the charter members of Mechanicsville were charter members of Cashaway. This certainly provides credence to the fact that Mechanicsville’s roots go back to the mid-1750s. 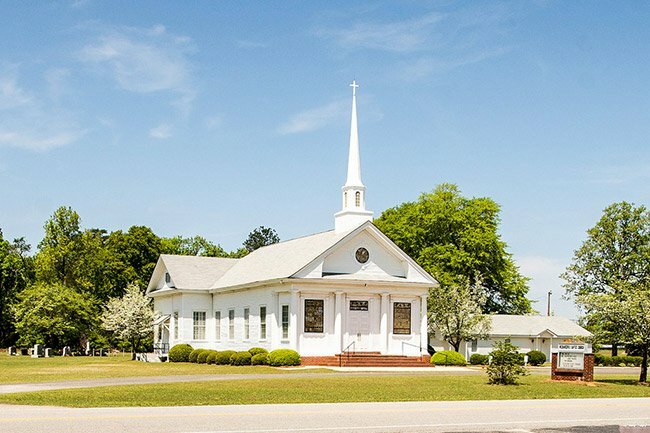 Regardless of what date you choose to align with, Mechanicsville Baptist Church has been a main stabilizing force for this area of Darlington County for centuries. The present building in which the congregation worships was constructed in 1920. A fellowship hall was constructed on the property in 1950, and an educational building was added to the original sanctuary in 1964. In the 1964 addition, extensive renovations were also completed in the sanctuary. As the congregation and fellowship continued to grow, a Family Life Worship Center was constructed across the road in 2000. To indicate the strength of this country church’s congregation, on Homecoming Day in 2002, $250,000 was raised to completely pay off the church’s indebtedness. If you’re still a bit confused, or if you’re more confused now than before reading this article, maybe you need to drive out to Mechanicsville. There is a lot of history to see, and it’s easy to find. From the Mechanicsville Church continue 1.3 miles north to the Mount Pleasant-Lowther’s Hill Cemetery Roadside Marker site on the right. There you’ll find one of the oldest cemeteries in Darlington County, established in 1789. From there continue another 3.1 miles north, crossing the Pee Dee River into Marlboro County to a stone marker on the left noting the Cashaway Church site. Remember, I’m always willing to receive information from anyone who may have more accurate information than I have; we’re in this together.